500 B.C. Archaeological work at Canyon City shows evidence that First Nations people have used this area for many thousands of years. There were seasonal fish camps above and below Miles Canyon and the Whitehorse Rapids, and First Nations trails extended along the banks of the river. Early explorers had little contact with the indigenous population, although Frederick Schwatka, in 1883, made note of a First Nations portage trail bypassing Miles Canyon, and George Mercer Dawson, in 1887, noted the large number of salmon above the canyon - salmon were one of the fish that were important to the aboriginal population. Traditionally, First Nations people were very mobile, covering hundreds of square kilometers in their annual round of fishing, hunting and trappping. The ranges of different groups often overlapped, and borders of traditional territories were not fixed. The Whitehorse area was probably part of the seasonal round of the Southern Tutchone and Tagish peoples of the Yukon interior, and Tlingit peoples from the coast were frequent visitors for trade. The Southern Tutchone word for the rapids is Kwänlin, and the Southern Tutchone of the Whithorse area call themselves Kwänlin Dun, or people of the rapids. In the early 20th century traditional patterns began to change, and many First Nations people moved to Whitehorse. Some had seasonal jobs there with White Pass, or worked in the area as big-game guides or trappers. 1896 On August 16, 1896, Skookum Jim, Tagish Charlie and George Washington Carmack found gold in the Klondike, and the Yukon was changed forever. It was nearly a year, however, before the outside world knew about the find; the steamship Excelsior arrived from the north in San Francisco on July 15, 1897, and the Portland arrived in Seattle two days later. Newspapers trumpeted the story of "a ton of gold" being on board. ascends the Chilkoot Pass, 1898. Photo by Winter & Pond. Word of the gold strike had already filtered out to miners and prospectors working in the north. In the early part of 1897 most of the people travelling over the Chilkoot Pass and on to Dawson were still experienced prospectors. On June 3, 1897, North-West Mounted Police Inspector W. H. Scarth reported "Large numbers of people camped at the White Horse." By the fall of 1897 the first neophyte stampeders had started to arrive; the new arrivals were inexperienced, and most weren't prepared for the rigors of the trip. The rush reached its peak in the spring of 1898. The Chilkoot tramway was dropping freight on the summit at the rate of nine tons an hour. Over 30,000 people poured over the passes, 20,000 of them in the period from the opening of the Customs post in mid-February to the beginning of May. 1897 The Whitehorse Copper Belt extends for approximately 30 km in the hills just west of Whitehorse. Prospectors on their way to Dawson discovered copper there in 1897, the first year of the Klondike gold rush. Jack McIntyre staked the first claim on July 6, 1898, and called it the Copper King. By the following year there was a great deal of activity in the area, including the War Eagle, staked on July 16, 1899 by Sam McGee of Robert Service fame. Other people tried their luck with claims like Hoodoo, Excelsior, Little Comet, Crooked Doctor, Le Roi, Ben Hur and Empress of India. In 1900, the North-West Mounted Police reported that "copper has been the all-absorbing question." Ore shipments began in 1900, with encouraging results, and continued until 1920. Mining was slow and labour-intensive, and miners faced high costs for development, production and transportation, as well as fluctuating metal prices. In spite of this, however, the area continued to develop. Between 1902 and 1909 the Territorial government spent $45,000 on 36 miles of wagon roads in the area, and by 1909 the White Pass & Yukon Route had built a railway spur to the mines. The Pueblo was the most productive of all the claims, at one time employing 20 people. There was little activity from 1920-1945, but mining resumed after World War II and continued until the 1980s. 1898 For the thousands of stampeders travelling down the Yukon River to Dawson, Miles Canyon and the Whitehorse Rapids were the most treacherous obstacles on the entire route. Canyon City, at the upstream end of the canyon, was the place where people stopped to plan their next move. Many unloaded their boats and labouriously portaged their goods; a few attempted to run their boats through. By June of 1898 a huge bottleneck had developed at Canyon City. Nearly 300 boats had been wrecked in the rapids, and five people had drowned; North-West Mounted Police Inspector Samuel Steele confessed: "why more casualties have not occurred is a mystery to me." In June, Steele issued an order that skilled pilots had to be hired to take the boats through. By then, a tramway had been built on the east bank of the river. It was eight km long and ran from Canyon City to the foot of the rapids, just across from the present site of downtown Whitehorse, hauling goods on horse-drawn cars for 3 cents per pound. A rival tram was also built, on the west bank of the river. A small settlement developed at Canyon City, and a townsite was even surveyed there. Although it thrived for a short time, by 1900 the railway was completed to Whitehorse, and Canyon City had lost its reason for existence. 1900 Of the many modes of transportation developed during the gold rush, the most practical was the White Pass & Yukon Route, a narrow-gauge railway connecting Skagway, at tidewater, with Whitehorse, at the head of navigation on the Yukon River. The first construction materials arrived in Skagway on May 27, 1898; work started the next day. The narrow-gauge route climbed north out of Skagway through the nearly perpendicular slopes of the White Pass. During the following winter, construction workers faced brutally cold temperatures and immense snowdrifts. But by July 6, 1899, the railway was complete to Bennett, at the southern end of Lake Bennett, where the White Pass and Chilkoot Pass trails converged. Construction then leap-frogged ahead to the third section - from Caribou Crossing, at the northern end of Lake Bennett, to Whitehorse - and boats and scows were used to carry workers and materials between the two sections. After the track reached Whitehorse on June 8, 1900, the construction crews concentrated their efforts on the difficult section of rail-bed along Lake Bennett. They closed the gap on July 29, 1900, and the last spike was driven at Caribou Crossing (now Carcross). The rail link ensured the future of Whitehorse. In 1901 the Whitehorse Star reported that as much as 300 tons of freight per day arrived in Whitehorse. In the early summer, when river navigation opened, there were four trains per day. 1901 Whitehorse developed quickly from a jumble of tents to a sizeable town. The settlement was originally located on the east bank of the river, at the terminus of Norman Macauley's tramway, but moved to the west bank with the completion of the railway. The first survey of the settlement, in 1899, shows what the Yukon Sun newspaper referred to as "a very cleverly laid out town." At the turn of the century, "white horse" was a common term for a standing wave or whitecap. The rapids just upstream from the town got their name this way. Although the community had commonly been known as Whitehorse - often spelled as two words - by prospectors and traders, the White Pass & Yukon Route wanted to change the name to Closeleigh, after the company's British backers, the Close Brothers. The Territory's Commissioner, William Ogilvie, ruled that the town's original name should be kept, since it was so well established. By the spring of 1900 there were wholesale houses and retail mercantile establishments, a hardware store, six large hotels, two drug stores, a brick yard, 2000 feet of warehouses on the waterfront, three churches, an athletic club and an electric light plant. Tents, log houses or clapboard buildings were found on practically every lot. 1920 The first aircraft in the Yukon were the four de Havilland DH-4 biplanes of the first Alaska Air Expedition, en route fom New York to Nome. They landed at Whitehorse on August 16, 1920. Aviation caught on quickly in the north; airplanes were well suited to the vast distances and rugged terain of the Yukon, and there were many lakes and rivers suitable for landing sites. Fliers became known as bush pilots; they had to have good mechanical knowledge, expert flying skills, and be able to work without any communication system. They also had to be able to survive in the wilderness. High speed was not essential for bush planes, but rugged construction and simplicity of operation were. In the early days of aviation, the Canadian post office allowed private companies to print and issue semi-official stamps for mail carried on aircraft, as an extra source of revenue for the companies. The stamps were to be placed on the back of envelopes, while regular postage went on the front, but in practise, they were more commonly put on the front. The Yukon Airways and Exploration Company, based in Whitehorse, was the first commercial airline in the Yukon. The company made the first commercial airmail flight in the Yukon on November 11, 1927. Their first airplane was the Queen of the Yukon; sister ship to Charles Lindbergh's Spirit of St. Louis, it was said to be the only commercial aircraft with charcoal foot warmers. 1942 After the Japanese attack on Pearl Harbour on December 7, 1941, the United States government was concerned that the transport of troops, equipment and supplies on the Pacific route was vulnerable to attack. The road now called the Alaska Highway was built as a year-round truck route for freight to Alaska. It also provided ground access to a series of airports that had been built to transport supplies to Russia. U.S. Army soldiers on Main Street, circa 1942. Construction of the 2500-km road began in March 1942 and was completed on November 20 the same year. The White Pass railway, with its terminus as Whitehorse - halfway between Dawson Creek and Fairbanks - provided access to the Pacific Coast and greatly facilitated construction. The railway was the project's main supply line and Whitehorse was its principal distribution point. The U.S. Army leased the railway from the White Pass; in 1943 they moved 281,962 tons of freight, equal to ten years of pre-war traffic. Tens of thousands of troops and civilian workers flooded into Whitehorse. Highway construction changed Whitehorse from a British company town to an American one. The U.S. government maintained the highway during the war and for an additional six months. After that, the portion in Canada became the property of Canada, and was maintained by the Canadian Army for approximately 20 years. The road was named the Alaska Highway on July 19, 1943, and opened to tourist traffic in 1947. 1950 By the middle of the 20th Century, Whitehorse had grown in size and importance. It was still the head of navigation on the Yukon River, although with the construction of the Alaska Highway, roads began to supersede rivers. The city's economic base had diversified to include mining, prospecting, transportation, services, government and tourism, and so greater stability prevailed. Between 1941 and 1951 the city's population doubled. In 1943 the Yukon Sub-division Headquarters of the Royal Canadian Mounted Police was transferred from Dawson to Whitehorse. The city was incorporated in 1950; until that time there had been no elected or appointed municipal government. After incorporation, a mayor and four-member council were elected (on August 4th, 1950), and many functions which had been carried out by the Territorial government were handed over. In 1951 the federal government amended the Yukon Act, increasing the number of members on the Yukon Council and providing for two of them to represent Whitehorse. 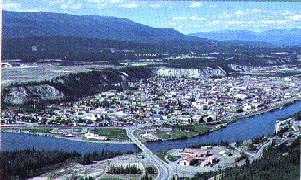 Two years later, on April 1, 1953, Whitehorse became the capital of the Yukon Territory, the most westerly capital city in Canada. 1966 In 1966 the S.S. Klondike was moved from the old shipyards to become a national historic site. The sternwheeler was just one of almost 300 boats that plied the Yukon River and its tributaries for more than 50 years. At the turn of the century the White Pass & Yukon Route railway - realizing that to be successful it would have to establish Whitehorse as part of an integrated transportation system - set up a subsidiary called the British Yukon Navigation Company (BYN). Aerial view of Whitehorse, 1997, looking northwest. BYN bought out one of its major competitors in 1900 and by the following summer owned most of the steamers on the Whitehorse-Dawson run. In the winter of 1900-1901 boats were being built in Whitehorse and the company had two sets of "ways" - timber cribbing for launching boats - at Whitehorse. By 1919 BYN had a complete monopoly over river transportation. White Pass had a warehouse 1500 feet long along the Whitehorse riverfront that could store 6000-7000 tons of freight. Whitehorse, at the head of river navigation, developed into the centre of transportation for the territory.